Your sadness may last for a night but joy will come in the morning. In the book of Ecclesiastes, it says that there is a season for all things. There is a time to weep and there is a time to rejoice. There are times of intense hardship and there are times of rest and peace. Today's promise from Psalm 30:5 is really speaking to those who are struggling right now. When I read this passage of Scripture, in my heart, I hear God saying "Don't give up! Keep on going! Joy is coming soon!" In the midst of any trials you may face today, be encouraged in knowing that they are only temporary. Joy is coming, so don't lose heart! It is in these dark times that we learn just how close God really is to us. A good friend of mine once said that the Gardener (Father God) is never closer to the branch than when He is pruning it (John 15:1-2). My prayer for each one of us today is that even in the midst of our trials and tribulations, we will feel close to our Papa and His promise that our sadness will be gone before we know it. 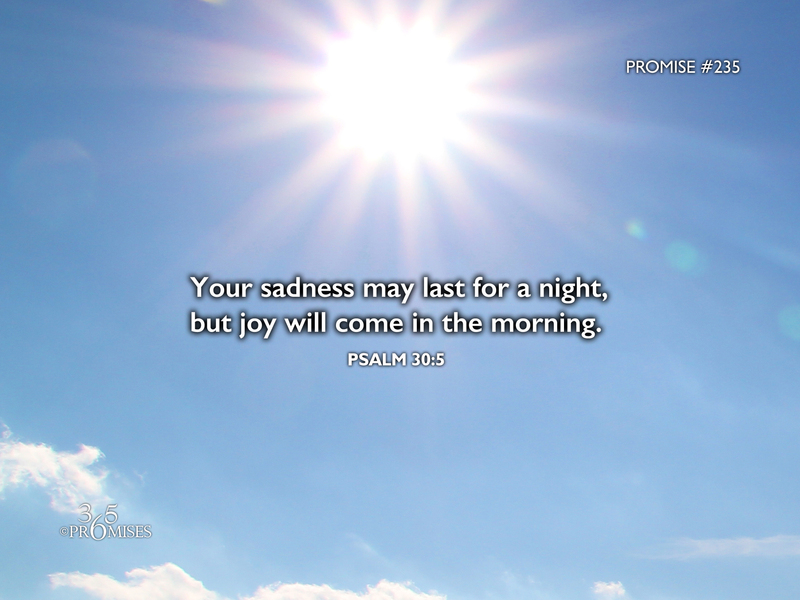 May each one of us cling to the hope that joy is indeed coming in the morning!